Growing up in the Midwestern river town of Chapel Springs, Indiana, Jade McKinley felt like a weed in a rose garden. When she left, she thought she'd never look back. Now, pregnant, alone, and broke, she has no other choice but to return. The mayor of Chapel Springs, Daniel Dawson, has been an honorary member of the McKinley family for years. While his own home life was almost nonexistent, Daniel fit right in with the boisterous McKinley family. He's loved Jade for years, but she always thought of him as a big brother. Now that she's back, his feelings are stronger than ever. As Jade attempts to settle in, nothing feels right. God seems far away, she's hiding secrets from her family, and she's strangely attracted to the man who's always called her "squirt." Returning home may prove more difficult-and more wonderful-than she ever imagined. 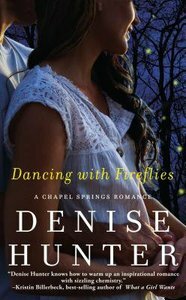 About "Dancing With Fireflies (Chapel Springs Romance Series)"
Customer Reviews For "Dancing With Fireflies (Chapel Springs Romance Series)"
I've just finished book 2 in 'A Chapel Springs Romance' by Denise Hunter. Book 1 Barefoot Summer was such a great story and I couldn't wait to read book 2. What a wonderful story of love, redeeming a future and such a reflection of Jesus love for us. I don't often have such revelation type moments that I share but this one has stayed with me today and it's beautiful in its many layers. Daniels a wonderful character in how his love for Jade is one that he has kept hidden but has shown in his actions towards her. His care and provision for her is so like Jesus towards us. Jesus doesn't push or demand or give to get; but gently gives us things that we need and allowes us time to notice He's showing us he's there and that only He can fill the ache, the need in our hearts. I've always enjoyed Denise's writting and this one I'd actually go as far as saying is up there with Lori Wicks 'The Princess'. A really lovely story. One that I got sad in, nostalgic in - I'll just say I have twin daughters, and leave you to read the story; and made me very blessed to have the wonderful Husband I have who loves me and waited for me. Read it you'll love it. Denise Hunter has written another fantastic stand-alone novel with this latest book. Jade is a troubled young woman, returning home after a difficult time away from her home town. As she immerses herself into small-town life, her good friend Daniel helps her pick up the pieces of a life changed by difficult circumstances. I found this book so hard to put down as I enjoyed the character development of Jade, Daniel and the families involved in the plot. Throughout the novel is a sweet picture of God's grace, even in the toughest of circumstances. I highly recommend it! Jade McKinley has moved home to Chapel Springs, jobless, broke and pregnant from a date gone wrong. Daniel Dawson has loved Jade for years, but his parents have political ambitions for him, and those aspirations will require a suitable political wife. Not Jade. Anyway, Jade still sees him as some kind of surrogate brother. Dancing With Fireflies is  a sweet romance with likeable characters that it's easy to feel for. My one complaint-common to all the Denise Hunter books I've read-is that it's more a clean romance than a Christian romance. It's not that the characters aren't Christians (they are), but more that their faith isn't a significant part of the story. I really enjoyed Dancing with Fireflies, because the characters are people I could truly empathise with. Jade is in an impossible situation through no fault of her own, and is now afraid to love. Daniel has loved her for years, but has been afraid to tell her, and is now spending more and more time with Jade. She's pregnant and doesn't want to tell her family at first, which leaves Daniel as her only support. As usual, the path of true love doesn't run smooth, but Dancing With Fireflies will leave you with a happy sigh. Thanks to Thomas Nelson and Litfuse PR for providing a free ebook for review. Order now to secure your copy when our stock arrives. Other edition is available. 9781401687007 0 Available. Expected to ship in 6 to 7 weeks from Australia.